Roguelike games often miss a certain theme or coating that gives the game that small extra edge, making it feel like it’s simply starting from zero over and over again, after your character dies. 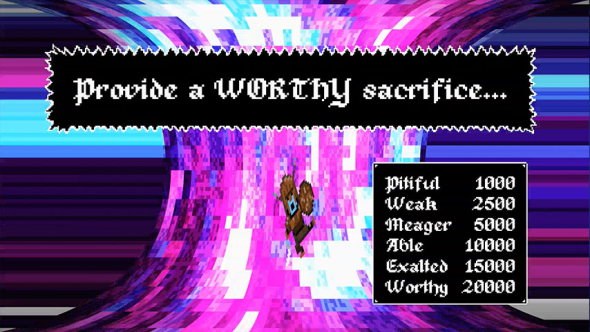 Of course, this is typical for the genre, but Temple of Yog tries to distance itself from the normal formula, by letting time go on in the digital world after each sacrifice has been made. In many aspects this original concepts works well, while there are a few obstacles to overcome, in this otherwise fun looking retro-inspired roguelike Wii U title. We’ll have to make many sacrifices in order to gain the boon of the gods. Most of us learned about the gods of the ancient past, who were rather vengeful, cruel and demanded a lot of their followers. Tributes had to be made at specific times, and constant devotion was required. Sadly, in some cases even human offerings had to be made in order to gain the favor of the gods. Temple of Yog revolves around human sacrifices for the gods but these sacrifices will never be granted an easy death, as they will have to prove themselves amidst many monsters, gaining the ‘boon’ of the gods. While this is all there is to the game, story wise, it’s still being presented in a fun fashion, as by gaining more boons, you’ll see short text based cutscenes, or will be commended for your sacrifice. Even though you have to start over again with your character, all characters will have randomly assigned names and the years will still progress, seeing your next character will simply be the next tribute in line, hoping to grant even more prosperity for your society. The better you tend to perform, the more years your fellow tribesmen will be able to go without having to send a new warrior to the temple (of doom). 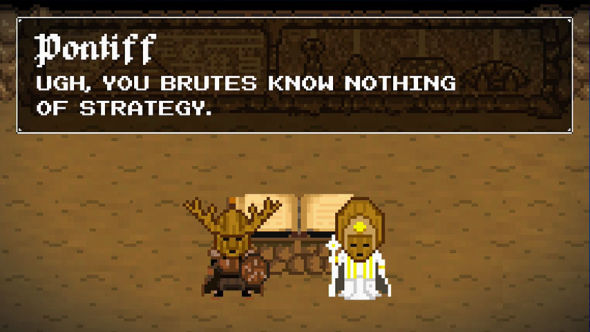 This first epoch of the Temple of Yog games feels like a blast from the past with the pixilated 8 bit graphics. The hub is bright and colorful and has amusing background art, while the levels themselves offer a bit of variety, but in the long run feel a bit the same, as the enemies are also rather limited. The game will only count a handful of different enemies, which will always use the same character models. Even though this is rather common, it would have been nice, if the enemy library was this slim, to have a few varying colors or slight differences in the different models. The playable characters themselves look pleasant and have the right appearance to make the game even grittier. Sound wise, the experience is also one you’d experience on your good old NES, albeit with slightly crispier sounding tunes. What the voices of the characters do to annoy you by their rather ear deafening SFX, the music makes up for, if not transcends the game to a new level. While many of the tunes may be overly looped, they will never become annoying and will get you in the proper mood to kill many of the evil foes that lurk in the temple. 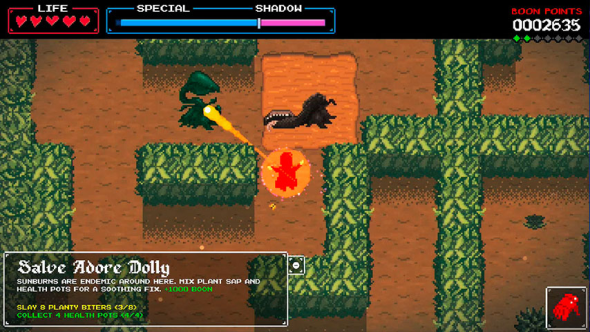 Temple of Yog: The First Epoch is a standard roguelike twin stick shooter, with the typical top-down mechanics in place. 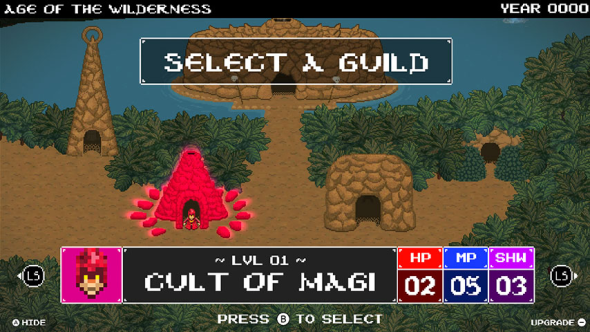 Nonetheless, the game has a fun mechanic in store, as you’ll be able to wade around in both the normal world, as well as the dark world when you decide to transcend. You’ll have to pick one of the four classes and you’re pretty much good to go on your adventure, which will more than likely cost you your life. That being said, even with death lurking around the corner, you’ll have to do your best in order to collect enough ‘boon’ points, to assure prosperity for society, and you can use these points to upgrade those warriors who follow in your footsteps. After deciding to either pick the cleric, mage, rogue or warrior, you’ll head off to the temple, which houses the portal to your impending doom. From here on out, things will follow the very typical ‘tower-based’ roguelike games, were you’ll have to keep going from one floor to another, by finding the portal, which is either in the normal or the dark world. You’ll have to fight off your enemies in both worlds, if you wish to make it out alive. Of course, you can skip some of them, if you’d rather get to the next floor more rapidly, but nonetheless, you’ll have to slay a sufficient amount of monsters if you wish to earn enough boon points to make your sacrifice worthwhile. Upgrades are quite simple, as they all do the same per characters (but you will still have to upgrade each character separately). You’ll get to choose to upgrade your maximum health points, mana points or the amount of time you can spend in the shadows of the dark world. It seems HP is one of the more important aspects, as some enemies already insta-kill you in the early floors of the temple, making it rather hard to make progress. Sadly, the game is rather unbalanced, seeing for example a level 15 rogue will have a lot of difficulties reaching the final stage of the game, acquiring enough points to make the necessary and acceptable sacrifice, while we were able to clear the game several times with a level 5 cleric, thanks to his ridiculous range and his healing ability. Nonetheless, even with the latter, it was still hard enough to reach the finish line of the game. It’s fun to see a small digital title make use of the Wii U gamepad in a proper fashion, as the ‘dark world’ is always visible on the tablet itself. This means you can keep your eye on the tablet to scout what is going on when you’d transcend on that spot, or simply to see if there are any points of interest. To be honest, when getting used to the game, this will actually become a key feature, that determines your survival or not. During your struggle to survive, you may encounter one of the six relics that will slightly help you on your way. These relics simply cause you to do more damage, walk faster, track the portal more easily, gain defense, magic or shadow power. Keep in mind that you can only collect one relic, which will go to the temple with your cold dead body if you die. This means that if you start out your journey with one relic and you replace it midgame with another one, only the last one will make it back to you, making the other one vanish from the temple. While all of the above is already quite amusing, the game does have a sufficient amount of bugs and other items that will hamper the otherwise fun formula. Not only is the enemy palette rather slim, they often behave in strange patterns, giving you a ridiculous amount of damage in mere moments, by speedy attacks or a sudden shift in their attack range. Other annoyances prove to be spawning in the middle of an enemy, which causes you damage, or spawn in the middle of a group of enemies, while there is also a group of monsters awaiting you in the dark world, making escape impossible. It’s also rather annoying when enemies suddenly vanish into thin air due to rendering issues or crawling through the plants, something they aren’t supposed to do. Sadly, even though this is a twin stick shooter, the aiming tends to be rather inaccurate and responds rather slow when you adjust your stick. Also this game could have been a lot better with a bit more options for the characters, as well as upgrades, but this is something that might follow in the sequels, as this is only the first epoch of four. 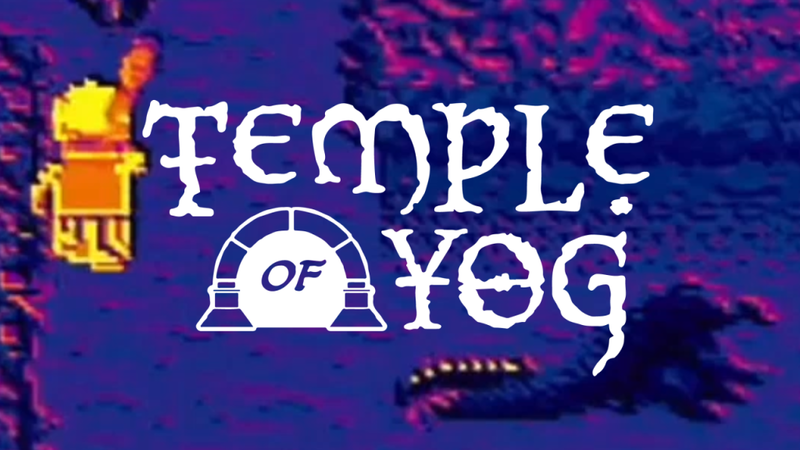 Temple of Yog: The First Epoch is a fun digital title for the Wii U, that distances itself from conventional roguelike games. The transcend mechanics prove to be very interesting and the classes might be cliché, but they certainly do the trick. Sadly, the game is still riddled with rough edges, small bugs and a lack of tweaks for your characters to truly blow you away. Nonetheless, how the game is presented to you makes us wonder what the coming epochs have in store for us, because if some of the issues named above are resolved, they will surely become hits.